What do a kayak, coffee creamer, and your sushi order have in common? Seaweed. Seaweed or macro-algae is a surprising and important part of what we do everyday. Even before natural products flooded social media or were “on trend”, the ecology and production of seaweed has had a long and varied history with people. Sushi, seaweed snacks, miso soup, and other food items clearly have seaweed as a component. For example, Nori, though it may appear greenish black in your sushi roll is actually a red seaweed that can be grown in the ocean on lines or cultivated in an aquaculture farm. In fact, farming seaweed is becoming a component in designing sustainable food systems. Even though it under goes processing to become food, it clearly is still seaweed. But, consider products such as coffee creamer, ice cream, and even gel based candies; they often include agar or carrageenan. These two ingredients are actually produced by seaweed. What are they? They are sugars produced by the seaweed and are released from the cells when the seaweed is mashed and/or boiled. They can act as thickeners, and behave similar to pectin, or sweeteners to give food or personal care products a certain texture or taste. The relation between these uses of seaweed and the kayak is a bit of a stretch, but bare with me. In addition to all the little ways we use seaweed everyday, there are all the ecological reasons seaweed is important up and down the California coast. 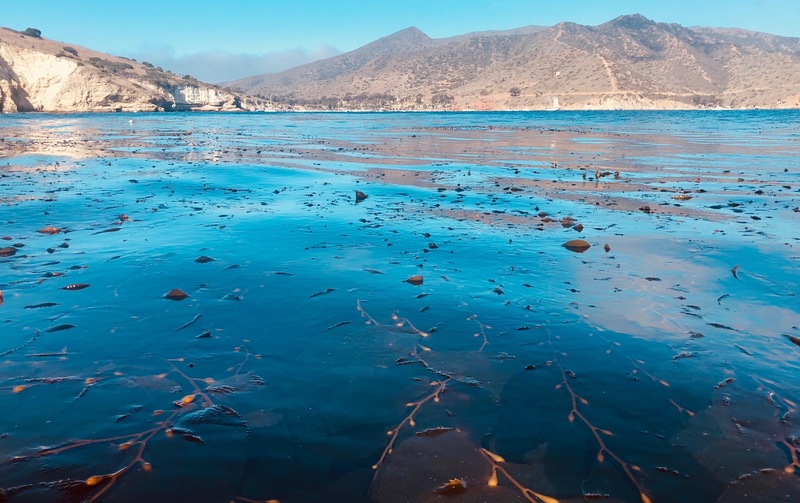 Here on Catalina, one of the largest and fastest growing seaweeds, giant brown kelp (Macrocystis pyrifera) creates a very diverse and productive underwater habitat-the kelp forest. Charles Darwin while traveling on the Beagle even believed these forests were more valuable then any forest on land because of the amount of life he observed. Giant brown kelp creates habitat, food, and protects other species from sun and waves. There is a whole system of interactions the build up around this one species. However, during the 2015/16 El Nino the kelp all but disappeared from Catalina. This left space open for Sargassum horneri, a species of invasive brown seaweed, to take over many spaces that used to be occupied by kelp. My research focuses on the interactions between juvenile giant brown kelp and sargassum under changing temperature. This is where the kayak comes in. Before I am able to track changes through time in growth and reproduction between these species, I needed a way to measure the length and weight of kelp without removing it from the water. 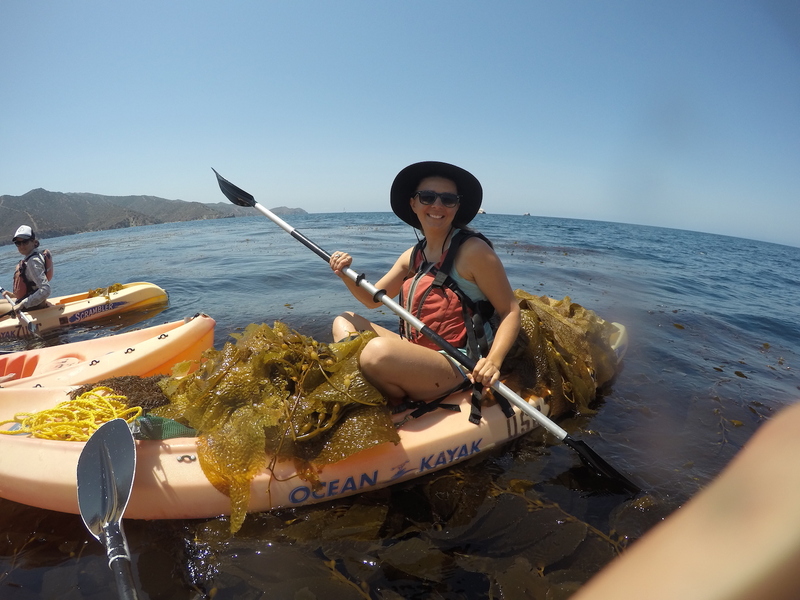 Using a kayak I have started my research stay at Wrigley’s Marine Institute by collecting kelp from holdfasts that have been set adrift and will eventually wash up on a beach. These fronds are helping to develop a series of equations that will allow me to estimate how much kelp there is in kelp forests around the island. Understanding how the kelp and sargassum change through time can provide insight into how these species are successful. Understanding how these species operate can aid resource managers in keeping our systems and seaweeds healthy for both the animals and people living here. This entry was posted in Graduate, Wrigley Institute on June 28, 2018 by Jessica Dutton. 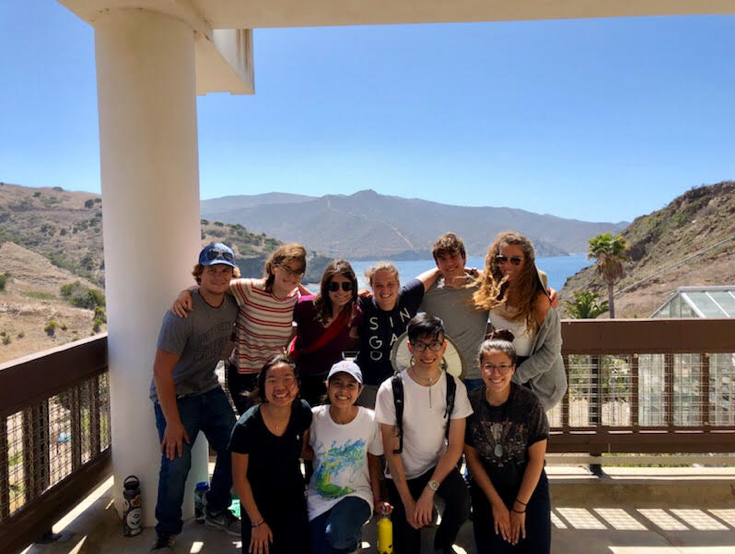 The Wrigley Institute 2018 NSF REUs (Research Experiences for Undergrads) have made it to the island! Upon arrival onto beautiful Catalina Island, I looked around to find stunning ocean views juxtaposed with a dry, desert-like land mass. Searching the sleep-deprived, slightly sea sick eyes around me around me, I realized everyone still had a smile on their face and knew I had chosen the right REU program to apply for. Just in the short two weeks I’ve spent in California, I’ve gotten to meet a fantastic group of fellow REU students, mentors and locals. Life on Catalina Island is composed of a complex system of well-oiled parts working in sync to promote sustainability and produce cutting edge research. This program has given me endless resources, research experience, confidence, networking, and educational opportunities. These in turn have helped guide me along my career path. As a junior marine science major with a chemistry minor at the University of South Carolina, I feel as though I’ve found my niche. My mentors from USC, Dr. Doug Capone and graduate mentor Yubin Raut, have supported me and helped get my feet under me in the beginning stages of the project. They have patiently corrected mistakes and answered questions, and for that I am incredibly grateful. 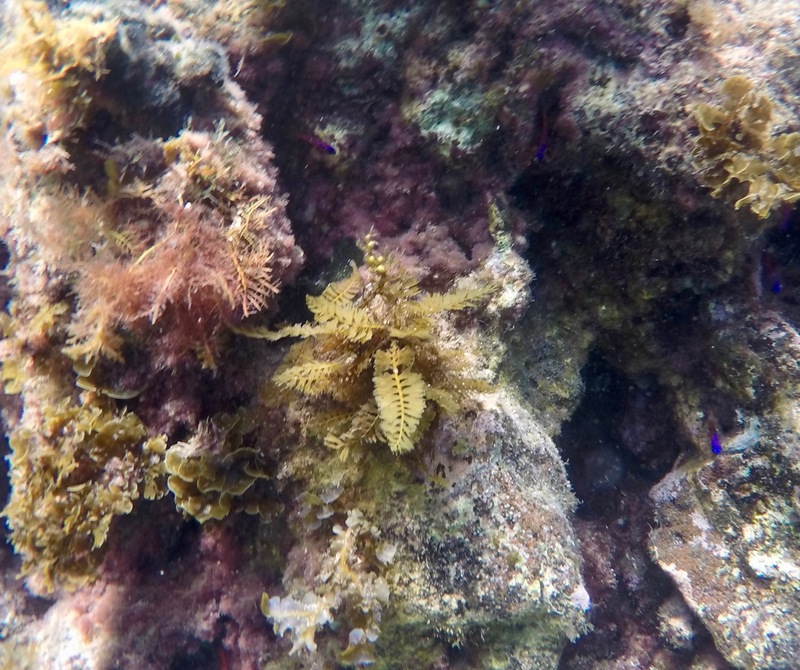 My project examines nitrogen fixation associated with the decomposition of different local macroalgae (for example, an invasive species called Sargassum horneri). Broadly, nitrogen fixation is a crucial part of both terrestrial and marine systems since most of the world’s nitrogen is in a gaseous form (N2) and biologically unavailable to most organisms as it is energetically taxing to break the strong triple bond connecting the two nitrogen atoms. However, nitrogen is a pertinent molecule for all living organisms since it is a building block of nucleotides in DNA/RNA, and amino acids which form proteins. Nitrogen fixation is the process carried out by specialized bacteria or archaea (diazotrophs) which utilize the nitrogenase enzyme to convert N2 to biologically usable forms such as ammonia. 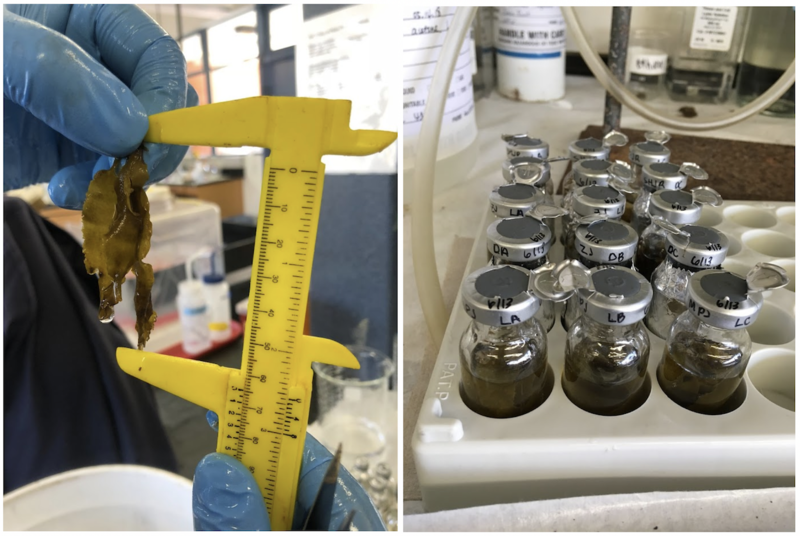 We can indirectly examine nitrogen fixation associated with macroalgae using the acetylene reduction method which analyzes ethylene production over a time period using a gas chromatograph (GC). Left: Measuring one of our samples of Eisenia arborea; Right: Aliquoted samples. However, life on Catalina hasn’t been all work! The island is an outdoor playground suitable for anyone wanting to stretch their legs. Catalina offers spectacular views from the Miss Christi, on top of a mountain, in a kayak, and even from Two Harbors! While I still have much to learn and explore about the island and scientific research, I couldn’t be happier being able to do it in a place I’ve come to love with people I’ve come to cherish. This entry was posted in Undergraduate, Wrigley Institute on June 25, 2018 by Jessica Dutton.